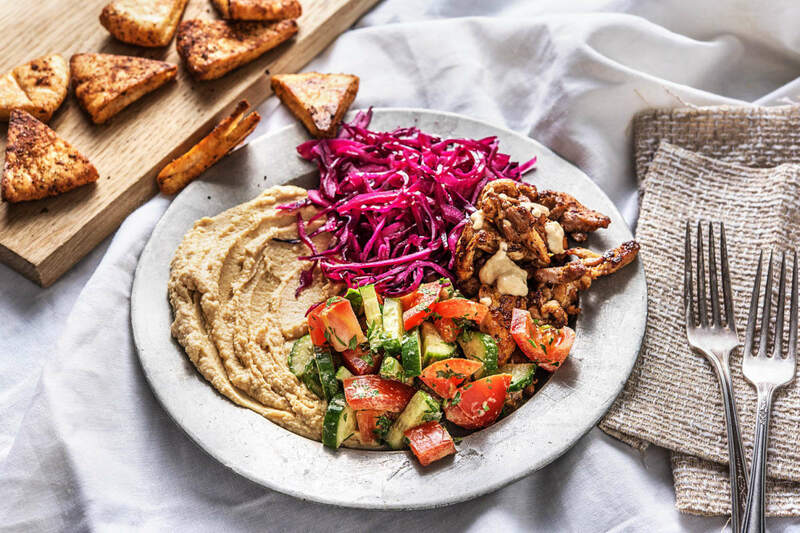 We've paired up with Sabra Hummus for a classic Middle Eastern shawarma plate. 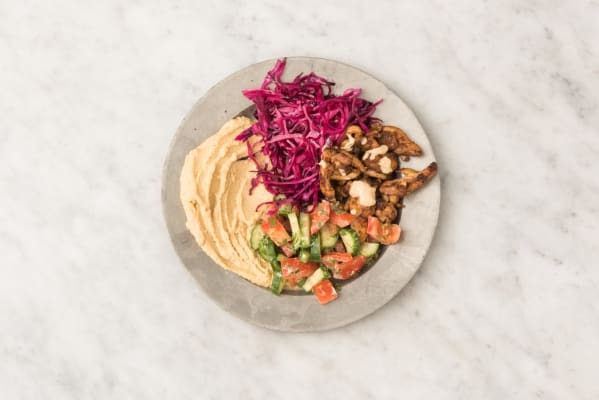 Our Shawarma blend is smoky, sweet and oh so delicious. Paired with pickled cabbage, crispy chickpeas and a bright and zingy tabouli salad! Its equally tasty and colourful! Preheat the oven to 450°F (to toast the pita). Start prepping when the oven comes up to temperature! Wash and dry all produce. * Peel, then mince or grate the garlic. Zest half the lemon (1 lemon for 4ppl), then juice the lemon. Roughly chop the parsley. Cut the tomatoes into 1/2-inch pieces. Cut the cucumber in half lengthwise, then into 1/2-inch half moons. Cut each pita into quarters, then each quarter in half to make 2 wedges. 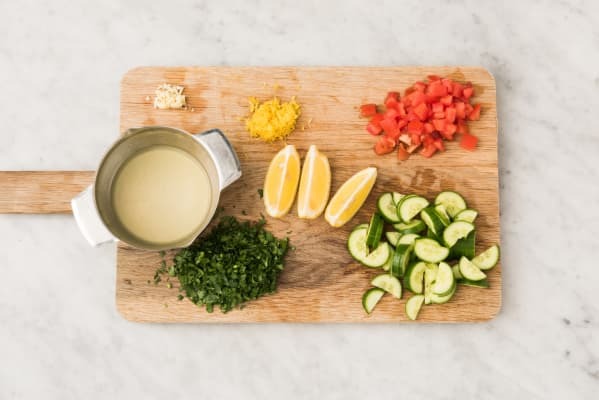 (You will have 8 wedges total per pita.) 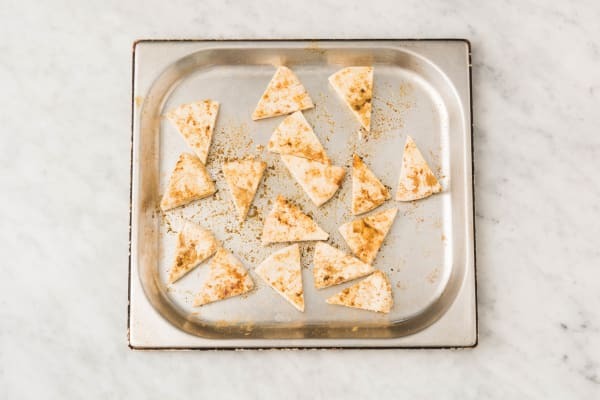 On a baking sheet, drizzle the pita wedges with 1 tbsp oil (dbl for 4 ppl), then sprinkle with 1/2 tbsp shawarma spice (dbl for 4 ppl). Toss to coat. Season with salt and pepper. Bake in the middle of the oven until golden-brown and crisp, 4-5 min. 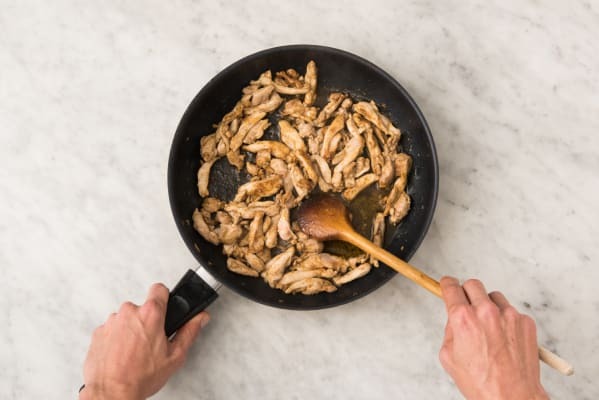 Meanwhile, heat a large non-stick pan over medium heat. When the pan is hot, add 1 tbsp oil (dbl for 4 ppl) then the cabbage, vinegar and 1 tsp sugar (dbl for 4 ppl). Season with salt. Cook until tender-crisp, 4-5 min. 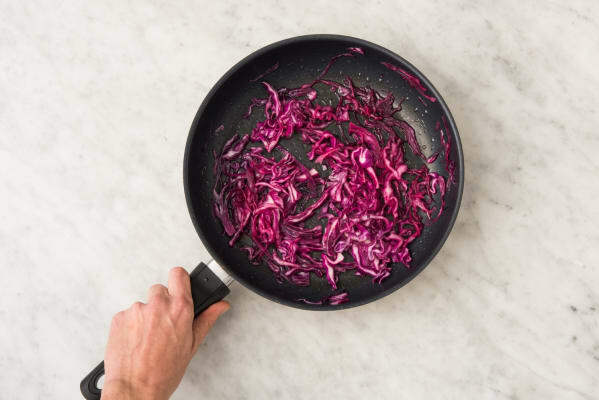 Remove the pan from the heat, then transfer the cabbage, along with the liquid, to a small bowl. Set aside. Meanwhile, in another small bowl, whisk together the tahini, lemon zest, lemon juice, 2 tbsp water (dbl for 4 ppl) and remaining garlic. 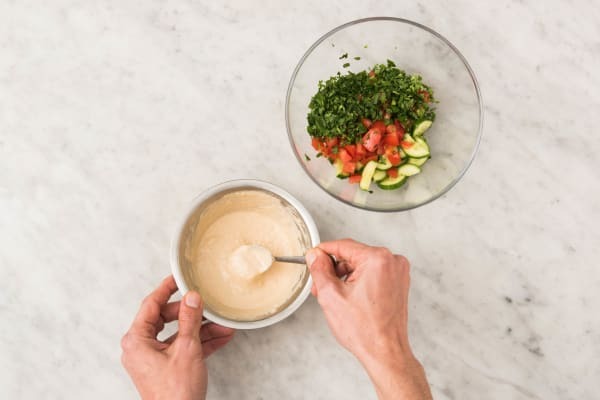 In another medium bowl, add the tomatoes, parsley, cucumber and 2 tbsp tahini dressing from the small bowl. Season with salt and pepper. Stir together. Set aside. Divide and spread the hummus between plates. Top with the chicken, salad and pickled cabbage. Serve with the toasted pita on the side for scooping. Drizzle the remaining tahini dressing over.